Deponia is the first episode of a three part trilogy of point and click adventure games by Daedalic Entertainment. Originally released in German in January of 2012, the game was not released in English until August of the same year. Now, with the final game of the trilogy right around the corner, it’s the perfect time to play through Deponia and its first sequel, Chaos on Deponia. Although it is not the pinnacle of storytelling and the main character is unlikable, Deponia is still a worthwhile representation of the genre. 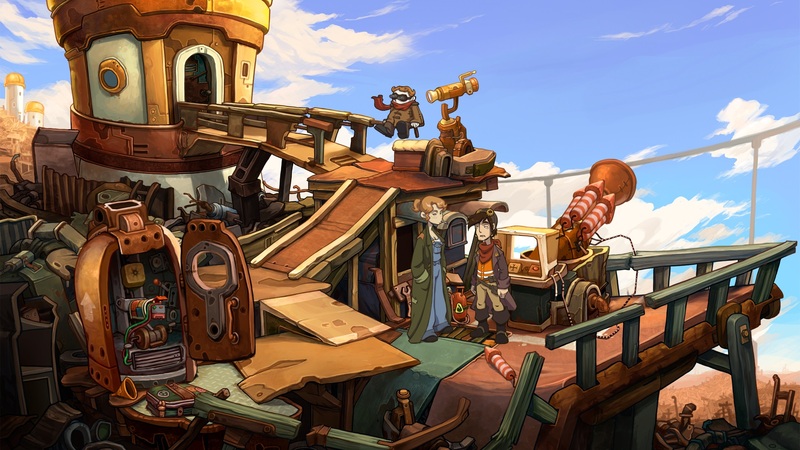 Deponia is a junkyard planet. Its inhabitants are forced to live off filthy water and to dig through garbage to find anything that might help them live out their lives. In one particularly large pile of garbage is a village called Kuvaq, which our main character, Rufus, calls home. Well… he doesn’t really call it that. His attitude suggests that Kuvaq is more of a prison to him than a home. 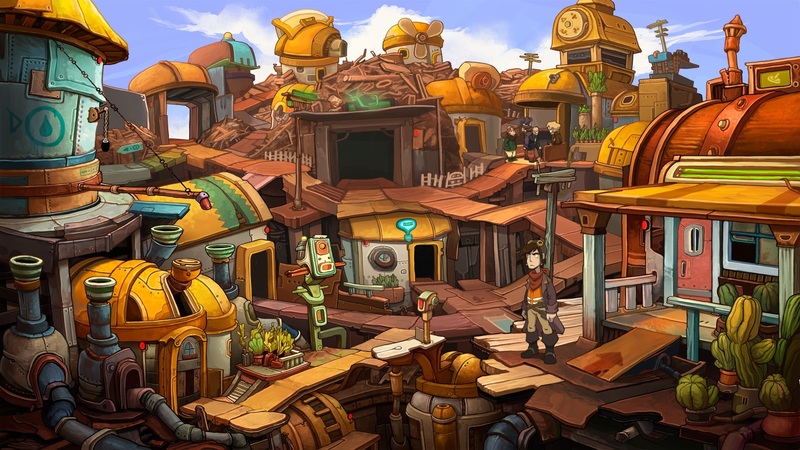 He dreams of one day living in Elysium, a city in the sky, where Deponia’s upper class take residence. And he will do anything, no matter how much it inconveniences or even harms those around him, to make his dream come true. Let’s face it: Rufus is not the most likable character. As the villagers of Kuvaq constantly remind him, he is an arrogant, selfish and an entirely worthless excuse for a human being, and he certainly has no chance whatsoever of reaching Elysium. Their condescension does nothing to deter Rufus, however. He stubbornly sticks to his plans and schemes, no matter what anyone says. From time to time, I enjoyed Rufus as a character. Throughout the game we do discover some other sides of his personality, and occasionally those are mildly likable. But for the most part, Rufus’ immaturity—working as intended—is not particularly entertaining. Though he constantly cracks jokes throughout the game, for the most part the only one laughing is Rufus. How far the humor in the game will take you is dependent on your own personality, but for me it fell flat. Rufus, his ex-girlfriend Toni, and the expressions they wear for each other. Fortunately, Rufus is not the only inhabitant of Kuvaq. The other characters are all much more likable. Even Rufus’ ferocious ex-girlfriend, Toni, manages to be entertaining despite constantly badmouthing our hero and screaming at the top of her lungs at him from time to time. Charlotte Moore’s performance as Toni was amusing, but a bit frightening in those moments. Then, there’s also Wenzel, Rufus’ friend and so-called sidekick, who helps Rufus with his schemes, if only to enjoy watching him fail. Then there’s Gizmo, who is responsible for all of Kuvac’s emergencies, taking the role of doctor, fire fighter and police officer as problems arise. Too bad he can only handle one role at a time. Finally there’s the heroine of the story, Goal, a mysterious girl from Elysium that Rufus falls for after she falls for him in a more literal sense (ouch). Goal might have been the most interesting character in the game if she had spent more of it conscious, but don’t fret; you’ll get to learn more about her in Chaos on Deponia. All of these characters are drawn in an art style that is reminiscent of many games and animated movies designed in Flash that are playable in web browsers, except fully realized and displayed beautifully in high resolution. The characters are animated well, and the game often looks like a fully animated cartoon. It seems the animators enjoyed giving a few additional frames of animation to their favorite (female) characters to make them interesting to watch (bounce), but as a whole, there is a lot of impressive animation throughout the game, especially when Rufus’ plans inevitably go awry. The backgrounds are also wonderful, and are filled with subtle details that make it a joy to go pixel hunting (searching for useful items and tools) in Deponia. Goal is unconscious again… but she’ll be very awake in the sequel. If you have ever played a point and click adventure game before, you will feel right at home while exploring Deponia. Progressing through the game is primarily a matter of solving puzzles by resourcefully using whatever happens to be lying around. 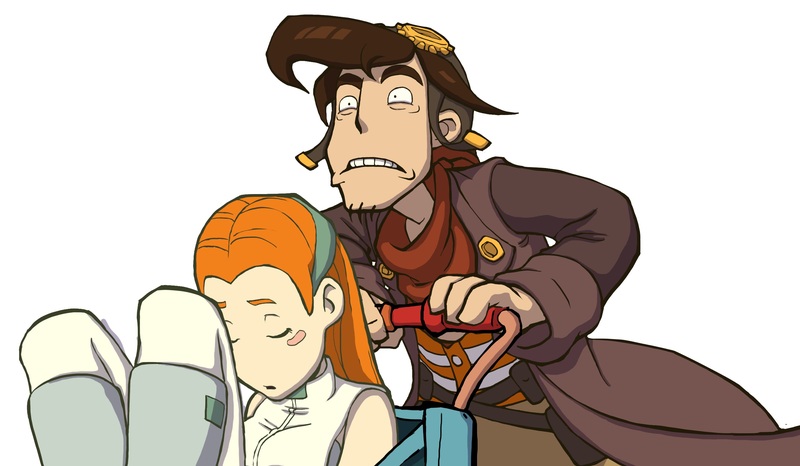 Deponia, being a trash planet, is a world filled with all kinds of strange and creative objects that are of course the perfect subject for the game’s puzzles. Who would have thought something as simple as making a cup of espresso could involve a dentist’s drill, asbestos gloves, handcuffs, chili peppers, a sponge, and a waiting number at the mayor’s office? Believe it or not, making the espresso requires a heck of a lot more than that, but such is the nature of this genre of games. The problem is that more often than you would expect, you might find yourself missing a piece of the puzzle. The puzzles in Deponia typically involve items that are scattered about a large area made up of multiple screens. I think it’s inevitable that most players will get stuck more than once while playing through the game, either because they overlooked an object or because the use of one is too difficult to determine. As in most games of this genre, items can be used on the environment, on people or even on each other to be combined into entirely new objects. There are moments when the player’s inventory is filled up with such a bizarre combination of items that it’s hard to believe that they will ever serve any purpose whatsoever. Still, it’s up to the player to painstakingly search every screen for anything that might be useful later on, because if a single item is missed, there will come a point in the game where it is impossible to progress until it is found, and even then, hours can pass before an item serves its purpose. Still, for point and click adventure games, this is just business as usual. I only wish there was some kind of “last resort” hint system in Deponia. I am ashamed to admit that there were a couple of moments where I had no choice but to search the internet for the solution to a puzzle, just so I could get the ball rolling again. In most cases I missed an item that was a little too well placed into the background or didn’t notice a new dialogue option with a character I had spoken to before. In any case, these moments did not detract from an otherwise enjoyable game. The storyline in Deponia doesn’t really get going until towards the end and serves to set up the next episode of the trilogy, but there was enough there to keep me playing until the end of the game. And although Rufus was frequently more annoying than amusing, I was still ready to spend more time with that character and started playing Chaos on Deponia immediately after the credits rolled. 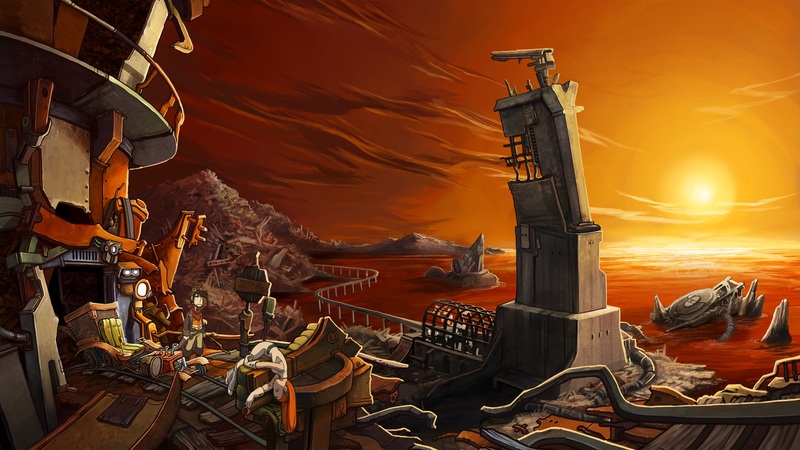 Though less experienced players might get frustrated and get stuck, any fan of the point and click genre should enjoy their time with Deponia, and so I am happy to recommend it. Ari purchased Deponia on Steam and completed the game in 10 hours.